Not the most interesting image visually, but it was a fun one to research nevertheless. This area first caught my eye because of the line of open clusters and the variety of catalogs that that these clusters are recorded in. It was a good opportunity for me to learn about these catalogs. Also, there are a couple bright nebulae (Sharpless 168 and 169) in the area. So, my first few subs were oriented to capture the clusters along with the Sharpless nebulae. However, my first Ha subs revealed half of a bright circular object that wasn't shown on my planetarium program. It turned out to be Abell 85. So I changed the picture orientation slightly, choosing to capture all of Abell 85 at the expense of losing the Sharpless objects. With that background, here is a brief description of the DSOs in the image. Abell 85, aka CTB 1 - the large, bright red circle in the lower left quadrant. It was originally cataloged as a planetary nebula but was later found to be a supernova remnant. Since the focus of this image was the open clusters, I didn't dim the abundant stars in the image, so they drown out the details of this DSO. The "B" version on my Abin page shows the highlighted Ha areas (as well as the center brightening of my Ha filter, unfortunately, which I will be working on eliminating in a future revision). King 12 - classification I 2 p, indicating a strong concentration, medium range of brightess, and less than 50 stars. I have seen one reference that says there are 15 stars in the cluster, while another lists 27 stars between mag 10-16. It is listed with a visual magnitute of 10.0. This cluster was in the first group of 21 open clusters cataloged by Ivan King in 1949. He added one more cluster in 1961 and five more in 1966. Harvard 21 - classification IV 2 p, meaning that it is not well detached from the surrounding star field, medium range of brightness, and less than 50 stars. It is located closer to King 12 than to NGC7788, which is the next cluster down the line. One source list it as containing six stars. Given that is listed with a visual magnitude of 9.0, my guess is that includes the five relatively bright stars that make a small sideways V, but I could be wrong. This catalog was compiled by Harlow Shapely in 1930, and includes 21 open clusters. NGC 7788, aka Cr 459 and OCL 275 - classification I 2 p (same as King 12). In the photograph, it does look similar to King 12, which makes me wonder why King 12 wasn't included in the NGC catalog. One reference has it as a visual magnitude of 9.4, with 20 stars in the cluster. The Cr designation is from a catalog of 471 open clusters compiled by Per Collinder in 1931 as part of his graduate thesis. NGC 7790, aka OCL 276 - classification III 2 p, meaning that it is detached from the surrounding star field but with no noticeable concentration, medium range of brightness, and less than 50 stars. It strikes me as having a similar concentration to 7788 and King 12 which have a concentration rating of I rather than III. it contains 40 stars, with the brightest at mag 10.9. This cluster contains three Cepheid variable stars. Berkeley 58 - classification IV 2 p (same as Harvard 21). 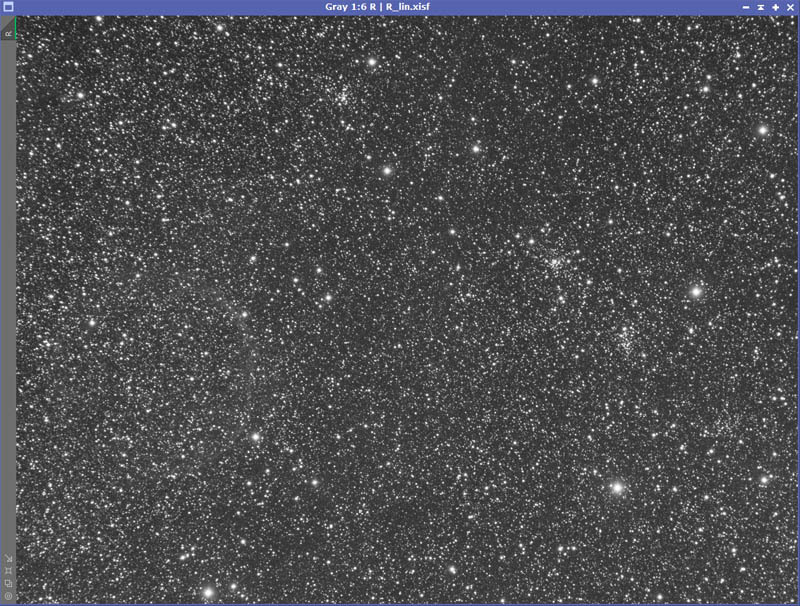 This is the last one in the line of clusters in the image, near the bottom right. It is listed as having a visual magnitude of 9.7, with 30 stars, the brightest at mag 15.0. A descriptionm from Deep sky Catalogs on github: "This Catalogue consists of 104 open star clusters, 88 of which were originally published in 1958 by Gosta Lynga of the university of California in Berkeley. Only 21 of these clusters are also included in other catalogues, including 5 NGC and 1 IC object. Berk 42 (= NGC 6749) is now classified as a globular cluster, one of the most difficult NGC globulars in the sky." There is one more open cluster in the picture, although it is basically impossible to find without a detailed star chart. It is Frolov 1. The book "Star Clusters and How to Observe Them" by Mark Allison describes Frolov 1 as "a tiny, curious little group of 4 or 5 stars visible in a 4" telescope, although a larger instrument will display several more members and reveal some of the fainter background stars. Located just under 3 deg North West of beta Cassiopeiae, the cluster itself is sparse and the brightest member only magnitude 10.6, so the overall appearance is subtle." It has a visual magnitude of 9.2. With the aid of a star chart, I believe that I see the four+ stars that make up the cluster, but I'm not certain. One last item of interest is a few stars from the Cool Galactic Carbon Stars catalog, compiled by C. B. Stephenson. These stars tend to be very deep red and not particularly bright. If I had a slightly wider field of view, I could have included the clusters Stock 17 and Czernik 1. All told, around a dozen DSO catalogs represented in the small slice of space. There are hundreds of other catalogs, but I found this an interesting learning exercise nevertheless. Fantastic image with a lot going on. I really like it. The technical card mentions 10 minute RGB's but only (well a lot of them) 2 minute luminance? That's a great image and, in my opinion, actually quite interesting visually. Thank you for the detailed write-up concerning the features and all those catalogs. I had the same question as Dan about the shorter luminance frames. Also, in your "B" version you say it's "Ha minus the red". Could you explain that in more detail, please? I'm not understanding this yet. Thanks! Thanks Ben. The "Ha minus red" image is actually a side effect of the PixInsight workflow that I use to combine Ha into the RGB image. I got this recipe off of one of the internet tutorials, but I don't recall which one. I find that I like the results much better than the NBRGBCombination script, although it may be due to pilot error on my part. where Ha is the window name of the Ha master (change as needed), RGB_R is the window name of the extracted red channel from the RGB image (again, change as needed), and the numbers 60 and 5 represent the bandwidth of my Red and Ha filters (60mm and 5mm, respectively). You would also change those values to match your filters' bandpass. With the "create new image" box checked on the PixelMath process, I apply the process to the Ha image. That is my "B" image on Astrobin. Only the brightest stars should be visible in newly created image (which will not look like much except for the Ha areas). If too many stars are visible, then kill the new window, adjust the R_bandwidth (60 in the equation above) to a lower value, then reapply. Leave the “Replace target image” box checked (hidden in the minimized Destination section in the screenshot above), then apply the process to the RGB image. To add more or less Ha enhancement, undo the process, adjust the BoostFactor (more to enhance the Ha, less to reduce it), then reapply the PixelMath process. 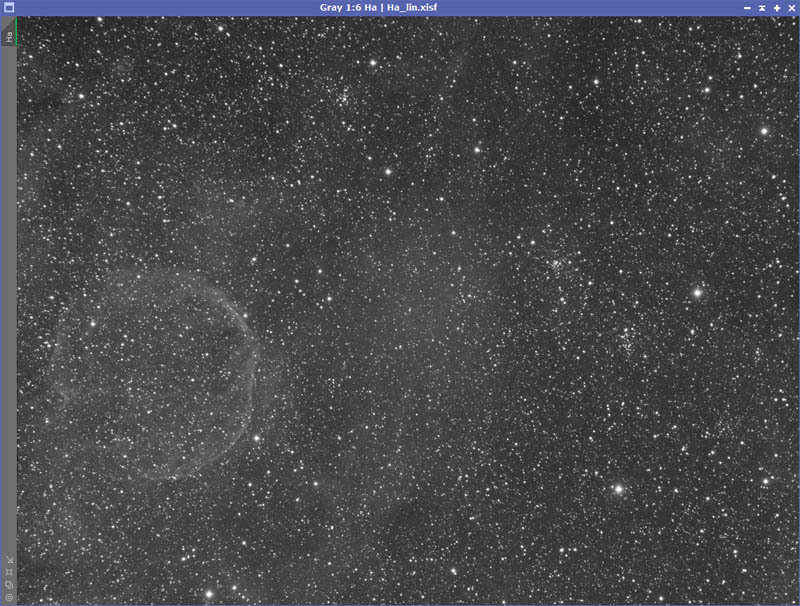 The fourth (and last) step is to do another background neutralization on the new RGB image (now an HaRGB image). I create a small preview in a background that doesn’t have any stars or DSOs. Then launch the BackgroundNeutralization process, select the preview as the Reference image, and apply it to the RGB image. More info than you bargained for, but hopefully this is somewhat useful. Edited by DaveB, 24 January 2019 - 08:14 PM. There are probably other ways of doing that as well. That was not my goal here; I was just looking to enhance the RGB image with some Ha. Thanks for the explanation, Dave. That's the level of detail I was interested in. That's a beautiful image! Love the star field and the colors. Thank you for the detailed annotation of the DSOs. 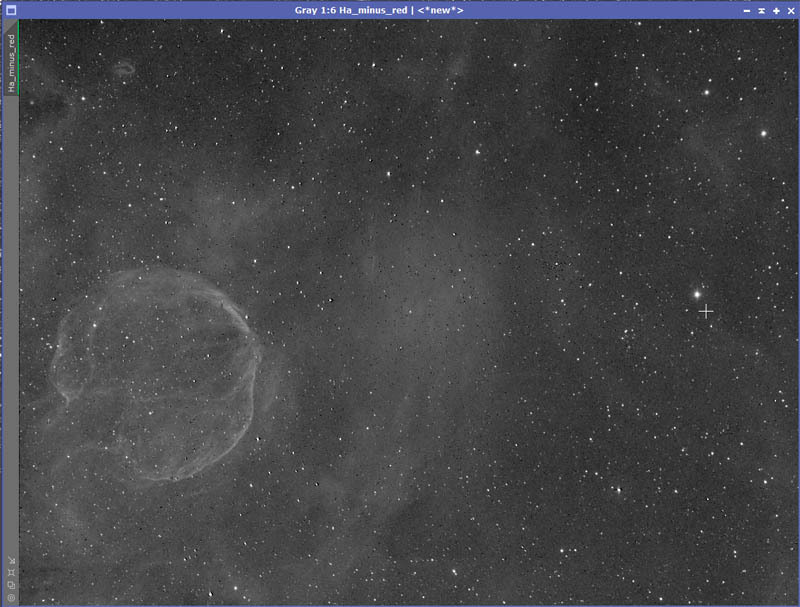 I have been using a very similar approach for narrowband and RGB combination and like it a lot. The same idea can be applied to luminance and Ha combination. The advantage of this PixelMath technique compared to NBRGBCombination script is that: (1) you see the intermediate Ha image with red continuum excluded and can really fine tune the ratio of Ha to R for optimal enhancement of the Ha signal; (2) you can tune Ha-Red combination for chrominance and Ha-Lum combination for luminance independently and to taste. Great image and very thorough research on the field. I was also imaging that same field a couple of months ago. I just went for the clusters rather than trying to capture the additional hydrogen alpha emissions in the field as well. Revision B is an annotated version. Thanks everyone for your comments. Dean, I like your image, it isn't as busy as mine, so it shows off the clusters nicely. For example, Frolov 1 is more readily visible in your image than in mine. Edited by DaveB, 27 January 2019 - 10:37 AM. I will definitely have to visit that area again next summer using the h-alpha filter. I wasn't aware of Abell 85.